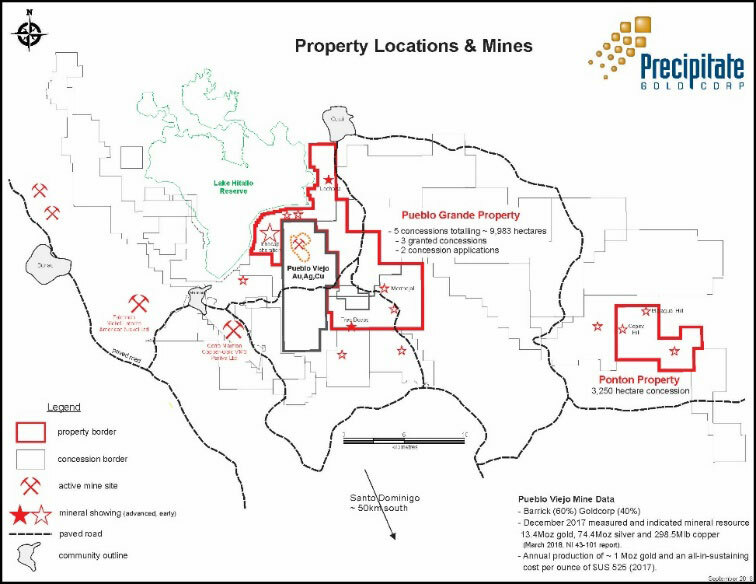 Precipitate Completes Acquisition o | Precipitate Gold Corp.
Vancouver, B.C. – January 15, 2019 - Precipitate Gold Corp. (the "Company" or "Precipitate") (TSXV: PRG) is pleased to announce it has closed the transaction previously announced with Everton Resources Inc. ("Everton"). 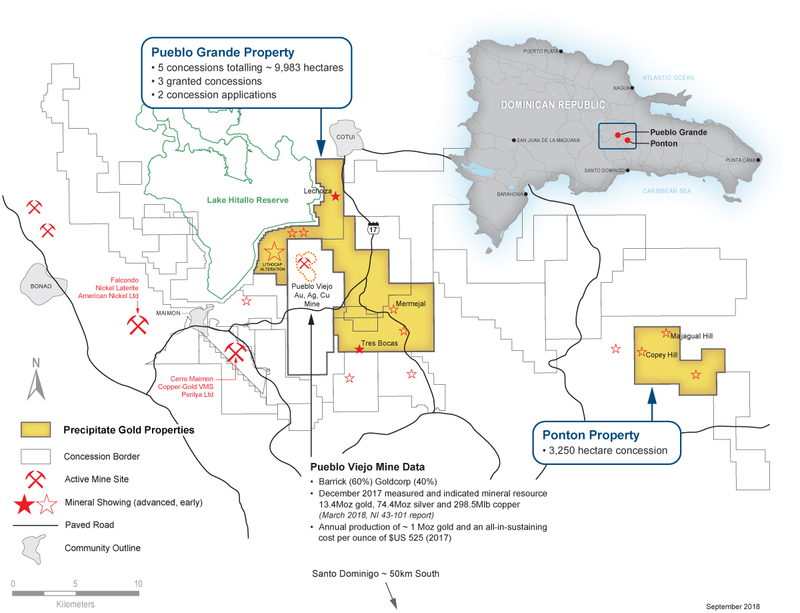 The Company has now completed the transfer of title to fully acquire ownership of all of Everton's Dominican Republic exploration concessions, consisting of Pueblo Grande Project, adjoining Barrick's and Goldcorp's world-class Pueblo Viejo gold-silver mine, and the Ponton Project located approximately 30 kilometers ("km") east of Pueblo Grande (see news release dated October 24, 2018). Jeffrey Wilson, Precipitate President & CEO, stated, "We are pleased to have completed our due diligence, satisfied all requirements, and attained the necessary government and regulatory approvals to close this transaction and acquire a 100% interest in this exciting new landholding adjacent to one of the largest gold-silver mining operations in the world. During our due diligence period the Company's technical team has been actively plotting up proposed first phases of work within certain priority target areas and we expect work activities on the ground to commence soon. In preparation for the completion of this transaction, as reported in recent months, the Company has bolstered its Advisory team with the addition of former President and Executive Director of the Barrick-Pueblo Viejo mining operation, Mr. Mejico Angeles-Lithgow and increased its technical understanding of the projects through the engagement of consulting geologist, Dr. Stewart Redwood. With the acquisition now completed, Precipitate and its team are ready to begin a first phases of work."